As some of you know, I have been very involved in a bakery business for some years now, and I thought you all might be interested in my newest commission- a Jane Austen themed Birthday Cake which was delivered last week. If you click on this link it will take you to my cake company’s website’s blog where you can find many more pictures of the commission and explanations of all the designs used. Enjoy! I’m delighted to report that the festival proved a huge success, attracting over 1500 visitors to the exhibition & the various related events. Everyone said how much they enjoyed it and how interesting it was to learn about Jane Austen’s important connection with early Worthing. As well as the wonderful exhibition itself, I, personally, particularly enjoyed the carriage ride, the Georgian concert & the dancing class. It was wonderful to attempt my first minuet, (amongst much confusion & laughter, I might add) ! The first image is of our guest of honour, Mrs Dorothy Matsutani, ( the 6th great niece of Jane Austen & direct descendant of Rear-Admiral, Charles Austen ), who is seen here cutting the ribbon to open the festival, cheered on by Worthing West’s MP, Sir Peter Bottomley. The little boy in Regency dress had just presented Dorothy with a gift from the organisers. The second image is of an information board & a lovely Regency dress, which formed one of the many attractive exhibits in the Georgian Room at the Chatsworth Hotel. The third image is of the two wonderful ladies, in the exhibition room, who had made an assortment of Regency costumes for children & adults to try on. This was highly popular, the bonnets being particularly in demand with the lady-visitors and little girls ! The final image is of the magnificent horses & carriage, which gave visitors the unique opportunity to view Worthing as Jane Austen did. This all sounds wonderful and I am so glad that it was a great success, especially after everyone had worked very hard on the project. Congratulations to all involved ! Crowdfunding Jane Austen’s Pelisse Article. I am sure that most of you are aware of the existence of a pelisse which may have been the property of Jane Austen and is now in the care of the Hampshire Museums Service. This article explores the physical qualities and historical contexts of the silk pelisse coat dated c. 1812–1814 associated with Jane Austen (1775–1817) through family provenance and now held by Hampshire County Museum Services and Archives. The author took an exact pattern of the pelisse (included), then made replica garments. The association with Jane Austen is considered using evidence from Austen’s letters about her tastes in colours, length of fabrics needed for clothing, and ownership of a silk pelisse. The silk’s oak-leaf pattern is interpreted as a British patriotic motif, especially during the period of Napoleonic conflicts. Questions and insights arising from the process of reproduction are discussed, and the pelisse is compared to other surviving garments, and to contemporary fashionable images. As evidence suggests the pelisse probably did belong to Austen, her physical characteristics that can be gleaned from the garment are compared with information about Austen’s appearance. Sounds fascinating, doesn’t it? It truly does. No doubt, dear reader, you would like to read it too…..but…as it is an academic article, unless you have access to it via an expensive subscription, ( £24 for a 24 hour pass) this won’t be possible. But…a light now shines for us at the end of the tunnel for, in a rather inspired move, Hilary Davidson is trying to raise the necessary funds( £500 or $800 US) to allow the article to be made freely accessible to all. A donation of just £2 / $2.95 will give you a PDF copy of the article the day it is published, sent directly to your inbox. If you would like to contribute more, a £10 / $15 donation will also get you an exclusive 15x15cm / 4×4 inch sample of the reproduction pelisse fabric being made by specialist firm Whitchurch Silk Mill, which I wrote about here. Do note that the silk has no fixed production date as yet so will take a little longer to arrive. As I write £181 of the total £550 has been pledged, and there are 53 days left to raise the remainder. Please can I ask you to contribute to this cause, for by pledging a very modest amount of money the article could be available to all, a wonderful notion I am sure you will all agree. Hello! Long time no see, hear or indeed anything. I thought you might be interested in this…. Janet Clarke of the Jane Austen Society has contacted me so that I can let you know of Worthing’s very exciting WOW (World of Words) exhibition which will take place between the 23rd May and the 7th June this year. A major new exhibition celebrating the link between novelist Jane Austen and Worthing is to take place next month. The exhibition, in association with Community First and the Heritage Lottery Fund (HLF), runs from 23 May to 7 June and, among many activities, will give visitors the opportunity to experience the town as the author herself would have, atop a horse drawn carriage. Jane Austen stayed in Worthing in 1805 and is said to have based many parts of her unfinished last novel Sandition on the town. Exciting activities in the exhibition will include a free family day with arts and crafts, children’s tours, a Georgian trio of musicians, a Regency dance display and an Indian-themed special screening of Bride & Prejudice; the Bollywood version of the Austen classic. The screening will include Indian food. For those who prefer to keep their feet firmly on the ground, two guided walks will take place; one in the centre of town and the other in Broadwater, both areas closely linked with Austen. The exhibition will run from 23 May – 7 June at the Chatsworth Hotel, Steyne Gardens Worthing, West Sussex BN11 3DU and is open daily from 10am – 3pm. Writers and Artists note: the organizing committee is looking out for an Artist and Writer in Residence….anyone interested is advised to contact Melody on melodystories1@gmail.com by the 24th April. For more details of the exhibition please go here. It all sounds fascinating, and I hope Janet will furnish us with some pictures of the exhibition, which would be lovely. Sorry, my friends but I’ve been rather busy to post recently…but I thought you’d enjoy this seasonable post about Georgian Christmases from Soho House, home of Matthew Bouton , entrepreneur,inventor and member of the Lunar Society. In 1644, only a century before Soho House was built, Oliver Cromwell banned Christmas! Carols were forbidden and anyone caught cooking a goose or baking a Christmas cake or boiling a pudding was in danger of fine, confiscation or worse. By the 1800s it was once again a time of celebration, having been reinstated by Charles II. The Georgian Christmas season began on 6th of December (St. Nicholas Day). Gifts would be exchanged both then and on New Years Day and the main feasting occasion was 6th of January (Twelfth Night, Epiphany). St Stephen’s Day was 26th of December and is now better known as Boxing Day as this was when servants would be presented with gifts and donations made to charity. Soho House in the snow. I thought you would love to read about this, held at one of my heros homes. I have been absent, but ….it might get busier here soon! Now in it’s third year, Jane Austen Day is celebrated each summer at Soho House museum and this year’s celebration took place just over a week ago. 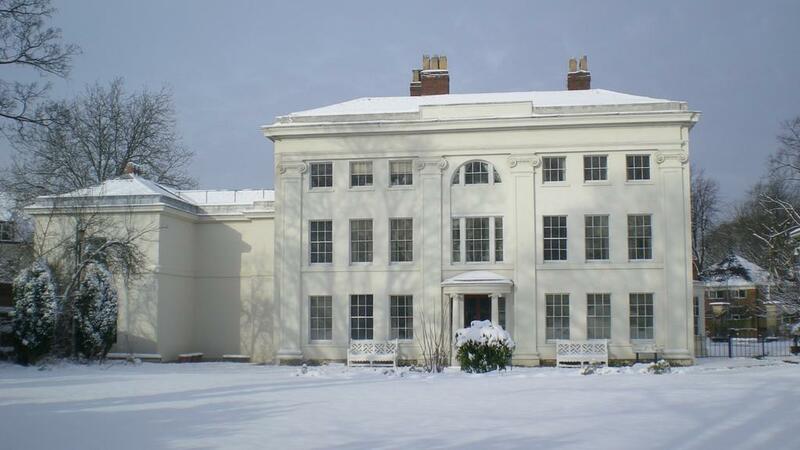 Although Austen herself never visited Boulton’s home, the Georgian property provides the perfect setting to bring the world of her novels to life. Austen was a novelist whose works earned her a place as one of the most widely read writers in English literature. Georgian society is the backdrop of all of Austen’s novels. Set during the reign of George III, they describe everyday lives, social hierarchies, gender roles, marriage, and the pastimes of well-off families. They provide an insight to the English society of this period. The James Andrews watercolour of Jane Austen has been sold at auction today. This afternoon, at auction at Sotheby’s in London, the watercolour was sold for £135,000, which when VAT and buyer’s premiums are added comes to a total sale price of £164,500. No news as yet on the identity of the purchaser. Sotheby’s are reported to have stated that it was bought by an anonymous private collector. According to the BBC News website, The Jane Austen House Museum in Chawton, Hampshire, did not bid because it could not raise the funds so soon after buying a ring that belonged to the author for £149,000 in September. If/when I hear anything I will of course let you know. You may recall that last year I raved about Jack and Holman Wang’s board book for children based on Jane Austen’s Pride and Prejudice. They promised to introduce more Austen titles and they have been true to their word. Their new title, the second in their Austen series, is Emma, my favourite Austen novel. I have fallen in love with the so very expressive felt characters in this book and their simple way of re-telling Austen’s classic tale in only ten words. Screenwriters please take note. Convinced of her own talent for matchmaking, Emma Woodhouse tries to make a match for her young protégé, Harriet Smith. Harriet’s past is sketchy, but Emma believes she deserves to marry a gentleman and sets her sights on Mr. Elton, the village vicar. Harriet receives an offer of marriage from Robert Martin, a prosperous farmer, but Emma persuades Harriet to turn him down and pursue Mr. Elton instead. Mr. Knightley,(above) the wealthy owner of Donwell Abbey and a trusted family friend, believes Robert and Harriet would have made a fine match and is furious at Emma for her meddling. He’s proven right when Mr. Elton professes his love for—Emma! Later, Harriet is saved from a swarm of gypsy beggars by Frank Churchill, a new face in the village of Highbury. Emma now sets her sights on setting up Harriet and Frank. One day at a picnic on Box Hill, Emma makes fun of Miss Bates, a poor spinster, for being long-winded. Mr. Knightley is angry at Emma for being so unkind. Emma not only feels sorry but also realizes she has always loved Mr. Knightley—and Mr. Knightley feels the same! Once it’s discovered that Frank is engaged to someone else, Harriet is free to pursue the feelings she’s always had for Robert, and everyone is happy! Slightly off the Austen track, there is now available a Cozy Classic version of Charlotte Bronte’s Jane Eyre.